Also, I apparently missed Conquest Sac again, which probably says more about my attention to conventions than about their advertising. Looks like a good time was had, and Black Cavalier reports that attendance seems to be up as well. Maybe next time then. We have been sick at our house, so not much hobby activity going on, which will hopefully change soon when the taxes are filed. I finally finished reading the Dungeon Masters Guide (DMG), which I got through the magic of inter-library loans. The copy I read was the revised edition from December 1979, and was in pretty flawless condition considering the age. 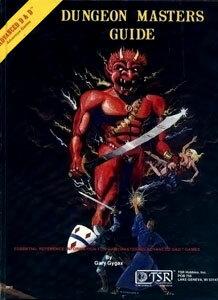 This is my first exposure to the book, as I was far too young to play AD&D when this book held sway. I suspect that most of you have read this book before, if you do not own it, so no need to recap its contents, but suffice it to say that it is a fairly comprehensive collection of tables and rules for running an AD&D game, hampered by a lack of organization, and a primitive layout. An interesting aspect of this book is that it clearly strives to present itself as "official" in a way that modern books do not. Modern RPG books either assume that you are only going to use the book you are reading, and make no mention of other books, or present their ideas as a menu from which you can pick and choose. The DMG is very strident in stating that it is the only way to do things... even while saying that "in your world you may do things differently". I suspect this has something to do with the various clone and competing games that were starting to appear at the time of its publication. Another aspect of the book, is that it is significantly less "generic" than most modern fantasy RPG books. By this I mean that even though most fantasy books have an assumed setting, it is expressed in such a way as to make it fairly easy to reshape. The world of the DMG is not presented in this fashion, instead, it is concerned with handling the minutia of planes, spell interactions, and potion creation. This presents a magic heavy world in a way that would take some work to refine down to a low magic world. All in all, this is a useful book for a DM, and even if you are not playing an AD&D game, there is some utility to be had here, if only for the random tables, and it is something that I am looking forward to adding to my permanent collection, even though I doubt that I will ever play the rules as written herein. The next book I am trying to get from the library is the Monster Manual II, so we will see how that goes.